The Thai New Year rolled around this month, perhaps not the most sacred holiday in Thailand, but certainly the most animated. With it came an intersection of church and state -- well, Buddhist temple and private school -- that caught up Joe and me. 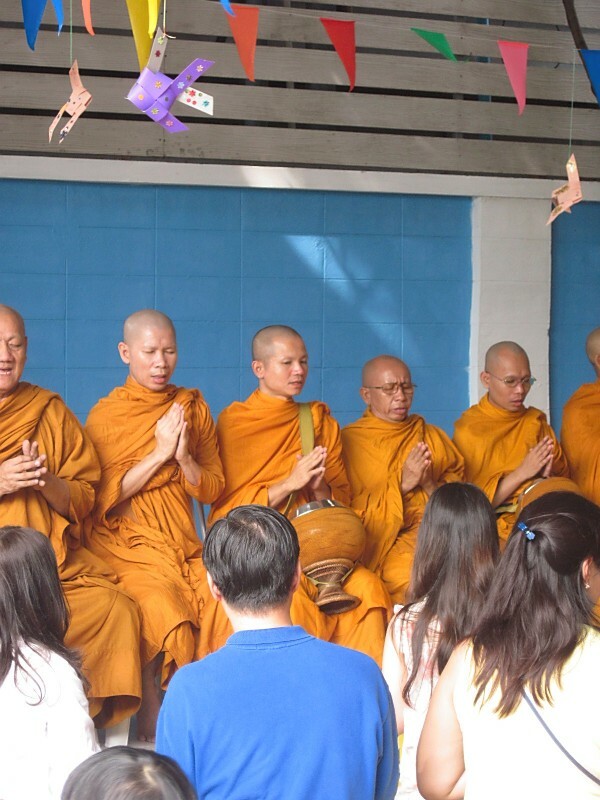 Last month, the St. Andrews kids were sent home with notices that said that anyone who wanted to donate to monks during the school Songkran ceremony was welcome, and that the monks would offer prayers in a ceremony afterward. I had to figure out how Joe should participate. Could he give alms to the monks? Sure. I'm all for donating to the needy and people who spend their lives in prayer. But should he take part in a Buddhist religious ceremony? I decided no. Joe will start first communion prep this fall. I want him to take his faith seriously -- no dipping into other rites. Besides, wouldn't the Buddhists disapprove of a nonbeliever jumping in? Turns out Joe was the only kid from his class who didn't. He spent the almsgiving and ceremony in the classroom with his teacher. He was invited to help give alms to the monks, but he didn't want to. I'm not sure why. He might have felt shy about handing things to strange adults, or maybe he just wanted to stay in air conditioning. I watched the ceremony that followed the almsgiving. Thai and non-Thai kids clasped their hands in prayer as the monks chanted. At the end, we all got sprinkled with blessed water. A senior monk dipped a bundle of sticks in the water and sprinkled us, then gave affectionate taps on the head to the children in the front row -- Asian and non-Asian. I hope next year, Joe and I will get to watch this together.